The measuring system consists of a needle probe in double coaxial geometry (see figure below) and proper electronic circuitry, responsible to generate and measure the signals involved in determining the complex impedance. where Vin is the complex excitation voltage and Iout is the complex output current. A direct digital synthesizer generates the sine wave excitation voltage. The current in the measuring electrode is converted to a proportional voltage by means of a transimpedance amplifier. Both voltages signals (the excitation voltage and the amplifier output voltage) are then fed into an amplitude-phase detector, which determines the amplitude ratio and the phase difference of these signals. The developed probe electronics is able to determine the complex impedance at a frequency of 10 kHz. where ω denotes the angular frequency (ω = 2 π f), ε0 the permittivity of vacuum (8.85 pF/m), and kg the geometry factor of the probe. The table below shows some measurements of the relative permittivity εr and conductivity σ carried out with the complex impedance needle probe for different liquids and air. The values in the table are the mean value of 20 measurements sampled at a frequency of 10 kHz. The excitation frequency was 200 kHz. The impedance needle probe was firstly calibrated on air and water, in order to measure the complex permittivity. Reference relative permittivity was taken from CRC Handbook of Chemistry and Physics. Reference conductivity was measured by a conductivity meter. 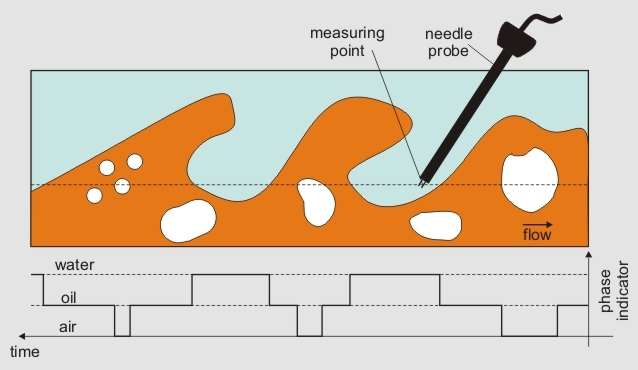 The needle probe system has been employed to measure air and water bubbles flowing in gasoline (εr = 2.02). The excitation frequency was again 200 kHz and sampling frequency was 10 kHz per channel. The needle probe was located inside an acrylic glass column. The flow of bubbles was synchronously recorded with a high-speed video camera to evaluate the needle probe data. First, air bubbles were generated at the bottom of the column. The following video shows the results for this experiment. The ascending air bubble is detected by the relative permittivity signal. As a second experiment water bubbles with conductivity of 1.4 µS/cm were dropped into the column (see video below). The descending water bubble is sensed by both permittivity and conductivity signals.